This is an update to a post done in Summer 09, with added photos to give a better “How to’ Guide! Things changed slightly on Linen Luxe yesterday. The radiator, basin, wc and taps all arrived and are fabulous, but I’d to alter the positioning of the existing radiator which is partly hidden by the door when open, blocking heat and accessibility. I want to move it across the room to underneath the window for two main reasons 1) the new one is far too glamorous to be hidden and it will look lovely in full sight under the window and 2) it’s far more cost effective not to lose half your heat to the back of a door! When designing or renovating you must keep visiting your site and ensuring all the plans work, because with the best will in the world, drawings sometimes just aren’t enough and things which weren’t immediately apparent may crop up during the build. The style of the suite and taps chosen by the client nods more to the Edwardian period than the 1930’s, but the dressing items will reflect a later art deco feel – the creams, limestones and blacks, and also in the shelving and mirror details. The Drummonds site is a nice link – the mirrors and styling are 30’s true, but without it being too strictly period. The client specified a steel rather than acrylic bath, so any fancy Art Deco styles were ruled out as they are very costly in steel. To bring some period styling into the limestone shaded room, I had the idea that a mirrored bath panel would look amazing….. could I find art deco style mirrored bath panels on line? No!! But without the funny rectangular insert! The first ones certainly reflect that art deco feel, but are a bit fancy pants, more for a living room / over a fireplace, however the last one looks just perfect. 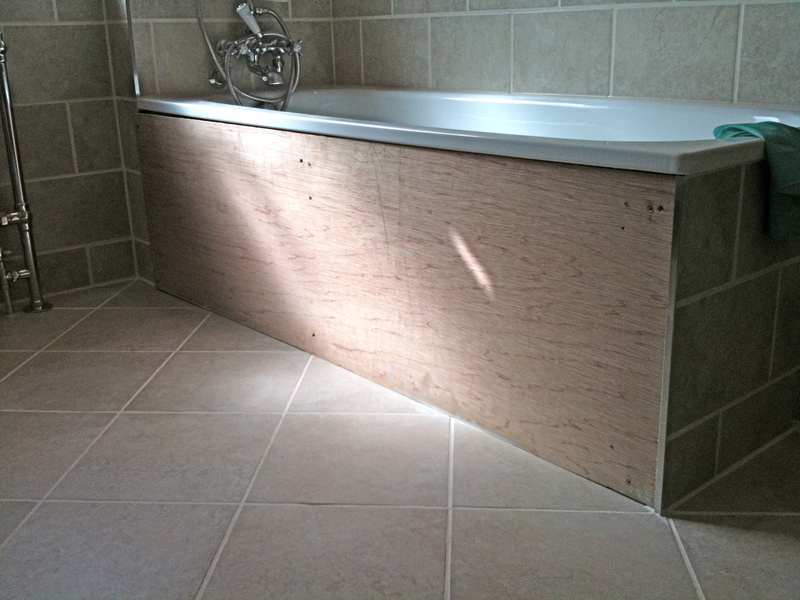 The bath was fitted in place and a timber frame built to give it stability. 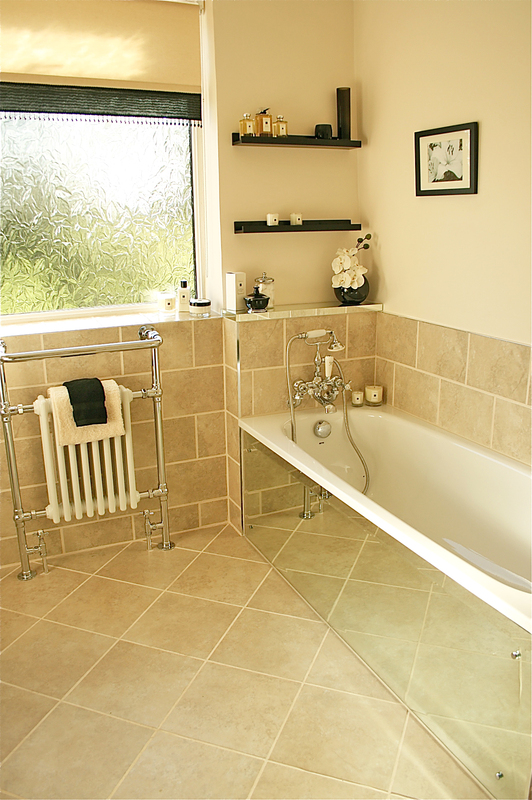 Make sure the frame sits approx 2omm back from the edge of the bath to allow for a plywood panel and mirror to be fitted to the front of it, otherwise the mirror will not sit under the edge of the bath – more prone to damage and chipping. I wanted the end (shorter) panel tiled, though you can also mirror this if you wanted, this end plywood can be screwed in place as it doesn’t need to be removed for access, unlike the main panel which you should be able to remove in case emergency pipe access for the bath is needed. This is an image of the 12mm plywood cut to size for the gap, prior to it being mirrored. It needs to be slightly smaller than the space, and have four holes drilled in it, one in each corner . The glass company must drill holes in the mirror before glueing it to the plywood, so the screws can pass through the mirror and the plywood and into the frame, then have little silver caps popped over the neaten. This means you can take the panel off if required. Also remember that the holes in the ply must correspond with the holes in the frame, don’t just drill holes in the plywood when its off the frame in case your screws dangle about in thin air when it’s fitted. Also if you are having a bevel border on the mirror, the screw holes will need to be further in than your bevel width. So, I took the plywood panel to a local glass company, specifying a 6mm thick mirror with a 5omm bevel to be made and stuck to panel…here’s the finished bath! The mirror should cost you something between £150 – £200. Of course, if you are in the Manchester area and need some on-site help, just email us! Life – Hey (Oscar winner!) Sandra Bullock, fancy a stepmom swap? Business – Twitter: can it replace ‘real life’ business support? 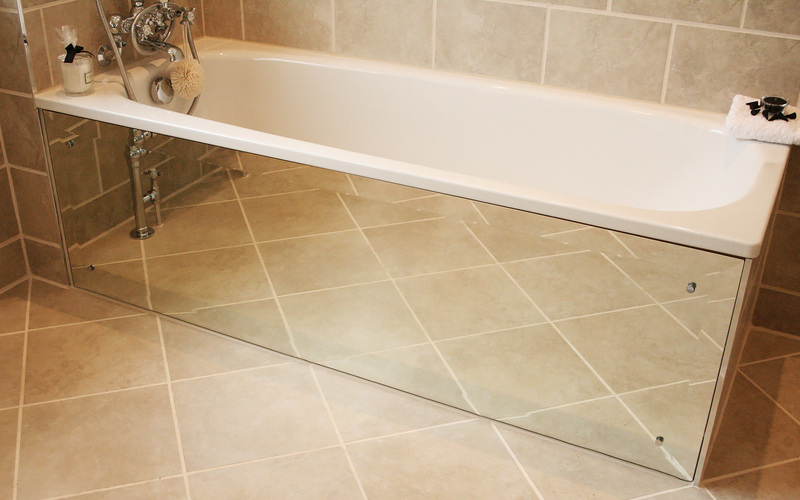 Hi – just found your site when searching for mirrored glass bath panels – exactly what I’d imagined for mine! Had also thought about getting a piece cut by local glazier – did you have to allow for flexibility of the bath when bath full/empty? Is the glass attached to a mdf panel which is slightly bigger to fit under the edge of the bath? Because we built a frame around the bath to which the ply and therefore mirror is attached, there is no need to allow for movement as the bath is fixed. I cut the plywood (more sturdy than mdf, think I used 12mm) to size and made sure it fitted with a small gap around then took this to glazier, who glued the glass to the mdf. I used limestone sealant around the edges as it matched the tiles. I need to do a step by step post on this, had lots of interest! Sorry, also had screw holes in each corner for extra hold! Thank you so much…i have been modelling my bathroom on this one when i came accross the image on a home inspiration wedsite a couple of months ago…now i can get the hubbie to create the mirrored panel! 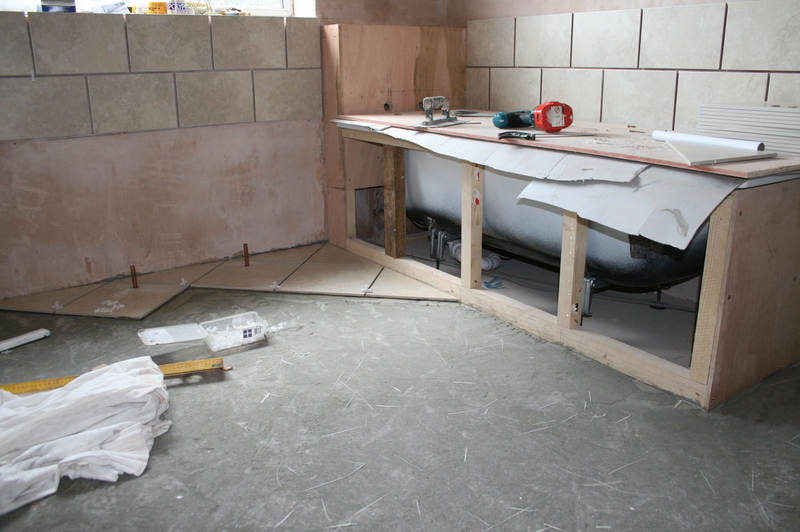 Tiling has commenced today so not long until can have a bath….thank goodness!! Where can l find an installer to fit a glass panel to bath, it’s a curved bath. Can I just check, you say the plywood needs to be slightly smaller than the gap needed. isn’t the mirror just cut to the size of the plywood?